Supporters of the opposition Movement For Democratic Change party protest economic situation. 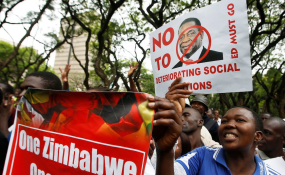 This comes as organisers of the demonstrations gave Mnangagwa a 30-day ultimatum, by which he should have drafted a framework for negotiations, or face a "tsunami" of more mass protests. The groups, which organised the total business shutdown, vowed to continue with sustained protests despite the government's heavy-handed approach in crushing dissent. Mnangagwa, whose legitimacy has been challenged ever since he won last year's presidential election by a wafer-thin 50,6% margin, is battling to set Zimbabwe's creaking economy on the recovery path. While the Zanu PF first secretary has previously said he does not talk to losers, the ruling party's spokesperson, Simon Khaya Moyo, in an interview with the Independent, did not rule out the prospects for inclusive dialogue. "We want those people with their proposals to come and approach us if they want dialogue. I cannot respond to a proposal that we have not received because I don't want to commit to anything. You do not invite the head of state through the media; there are channels to do that," he said. But as calls for dialogue between Mnangagwa and his political opponents gained momentum, contradictions emerged within the security establishment, with both the army and police denying responsibility for the death of at least 10 people during the three-day business shutdown, triggered by Mnangagwa's recent decision to increase fuel prices. Pressure group #Tajamuka frontman Promise Mkwananzi -- widely identified as one of the principal architects of the protests -- said the country needed an urgent, all-inclusive process which will usher in a transitional mechanism. The process -- to precede a general election -- should be spearheaded by the Southern African Development Community (Sadc) and the African Union (AU), Mkwananzi said. "We are putting the government on a month's notice to address the issues we have raised or else they will face more anger from the people. This process should be underwritten by Sadc and the AU community. The priority of the process should be on implementation of the constitution and revival of the economy," Mkwananzi said, as he distanced his grouping from messages circulating on social media suggesting that more protests will be held next week. "After that, then we can have fresh elections because the reason why we are in this economic mess is because of flawed elections, which resulted in a legitimacy crisis for the current government," he said. MDC spokesperson Jacob Mafume said this week's protests had exposed Mnangagwa's government. He said the opposition is still open to dialogue. "The economy and the people have passed a vote of no confidence on Mnangagwa and his government because they got into power illegitimately and there is an illegitimacy crisis that has not been solved. In terms of dialogue, we have said it before that we are open for dialogue and we can be part of the dialogue process to restore Zimbabwe," Mafume said. MDC leader Nelson Chamisa's spokesperson Nkululeko Sibanda called on Sadc and the AU to immediately intervene in the current political impasse. "Sadc must intervene and investigate these serious circumstances in which crimes against humanity were committed. Mnangagwa and Chiwenga are adversely affecting the image of the region and bring Sadc into disrepute over and over," Sibanda said. "The citizens' protests are a clear indicator that things are not working and political actors must swallow their pride and go to the dialogue table and chart a new inclusive way forward for Zimbabwe. The senseless violence by state security agents and military trivialises human life and does nothing to help resolve the economic challenges," political analyst Maxwell Saungweme said. Another political analyst Piers Pigou weighed in, saying dialogue should not be exclusively between MDC and Zanu PF, but inclusive of other political actors. "He (Mnangagwa) needs to talk to a range of actors, including but not exclusively to the opposition. It seems unlikely an exclusive political arrangement will be adequate," Pigou said. Rhodes University political science lecturer Mike Mavura dismissed the likelihood of political dialogue. "Mnangagwa is a politician not a statesman, so we can forget any idea of him reaching out to the opposition. A statesman sees the bigger picture and acts in the best interests of the country not just his own or his political party's narrow interests," he said. "If ED (Mnangagwa) was a statesman, his narrow election victory would have morally and strategically compelled him to include in his government some ministers from the opposition so that those over two million opposition voters have a say and are in direct dialogue with him but, alas, the man is more goon than visionary," Mavura added. The protests also exposed the contradictions and divisions within the country's security services as both police and army shifted blame and denied responsibility for the killings. "This is a police operation, talk to the police spokesperson. Did you see the army shooting people? I don't know about that," Mugwisi said. "People were shot? I don't know of anyone who was shot," she said before abruptly terminating the phone call. "I am a deputy minister, I don't sit in cabinet. I don't have an idea who ordered the shooting. Don't make me meddle in issues that are beyond me. You know very well who gives orders," Matemadanda said. "The way the demonstrations were organised, the nature of deployment and tactics implemented all point to a well-trained army in force which openly belonged to the opposition MDC Alliance which is trying to get to power through the backdoor. Of particular interest is their tactic to remove action from the CBD (Central Harare) and decentralise to ward level and use innocent civilians as human shields which is a military strategy," Mutsvangwa said, blaming the MDC for the violence. "Veterans of the liberation struggle will ensure that we have strengthened our strongholds because the MDC has shown how violent they can be," he said. "The opposition's political actions have been reflected in some of our civil servants. Government must therefore ensure that there is a complete overhaul of our civil service, especially removing those that seem to act in a manner that leaves government vulnerable to unnecessary embarrassment by enemies of the state," he said.